The relationship between government and the press is often adversarial, but usually both institutions understand the necessity of maintaining a working relationship that benefits both sides and the country as a whole. In the other Washington, that understanding went out the window in January, along with much of what we’ve taken for granted about how our country works. The face and voice of the Trump administration in its daily dealings with the Washington, D.C., media is press secretary Melissa McCarthy — no, wait, Sean Spicer. 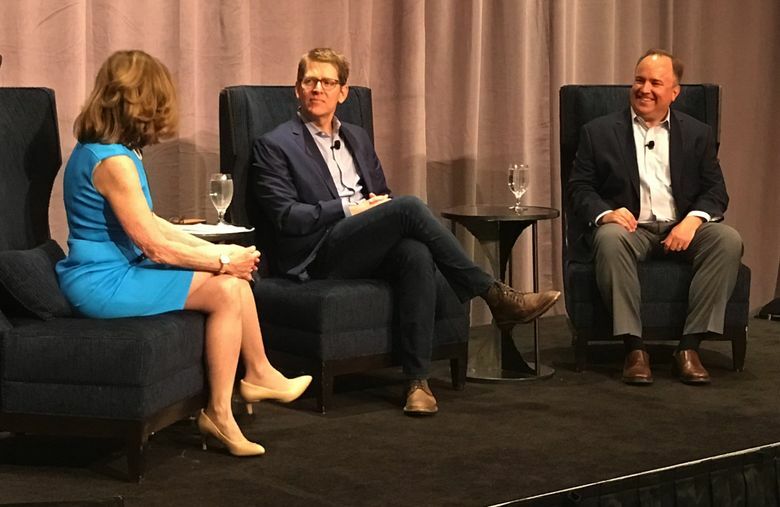 Two former White House press secretaries discussed the job during Seattle CityClub’s annual fundraising luncheon Wednesday at the Seattle Marriott Waterfront. They agreed it’s best to do the job in a way that doesn’t lead to being the object of parody. They both came away from the White House with enough credibility to land sweet jobs afterward, despite dealing with their own challenging moments with the media. Jay Carney was press secretary under President Barack Obama from 2011 to 2014. Before that he was Time Magazine’s Washington bureau chief, 2005-2008, and in 2015 he went to work for Amazon as senior vice president for global corporate affairs. Scott McClellan served as press secretary under President George W. Bush from 2003 to 2006 and now is vice president for communications at Seattle University. The moderator, Seattle journalist Joni Balter (formerly of The Seattle Times), asked what advice the two men would give Spicer. McClellan said Spicer has chosen to willfully sacrifice his credibility. McClellan added that he and Carney both have empathy for anyone who has to stand at the podium in the White House briefing room and be peppered with questions. But it didn’t bode well to go out the very first day and attack the press, as Spicer did. The administration accused the press of lying about the crowd size at Trump’s inauguration. Spicer in his first meeting with the press claimed, without proof and despite visual evidence to the contrary, that the attendance was the largest in history. Then he lectured the media. Trump’s disdain for the press preceded his election, but the constant conflict is not what we expect from a president when speaking, or tweeting, to the public. Spicer has to deal with that daily and with the expectations of his boss. Presidents want coverage that makes them look good, and they don’t like reports that challenge them. That’s not new. Balter asked how the former secretaries balanced a desire to give news a positive spin and the need to preserve their own integrity and that of the administration. Carney said he was not asked to lie, and he never said anything he didn’t believe. McClellan said a press secretary’s main asset is his credibility, so it was important to him to preserve that. They talked about some of their more difficult challenges. Carney said it was hard dealing with a flood of questions about the trouble people had signing up for coverage under the Affordable Care Act. You may remember the rollout was a mess, and his spin efforts didn’t win any points with the press. McClellan had to field uncomfortable questions about the decision to go to war with Iraq. What’s happening now is different. People in the administration say things that aren’t true, and their spokesmen have to deal with that. The president declares the mainstream press the opposition party and expects his people to back him up. Carney said the issue is not who the press secretary is. “That’s a symptom, not the disease itself,” he said. And he said that although George W. Bush and Barack Obama are very different people, they are both patriots and committed family men. He said it was a privilege to cover the Bush administration as a reporter and a privilege to work as press secretary for Obama. Who will say those things about this presidency?